Syracuse center Paschal Chukwu (13) attempts a layup in the first half. Mandatory Photo Credit: Kicia Sears, The Juice Online. WHAT HAPPENED: With 3:57 left in the first half, an Anthony Green dunk made it 26-23. From there, the Orange went on a 9-0 run capped by a 3-pointer and a pair of free throws from Oshae Brissett to close the half to take a 35-23 lead into intermission. Brissett’s layup with 7:33 left in the second half gave Syracuse a 57-37 lead, and the Orange was in complete control from there. 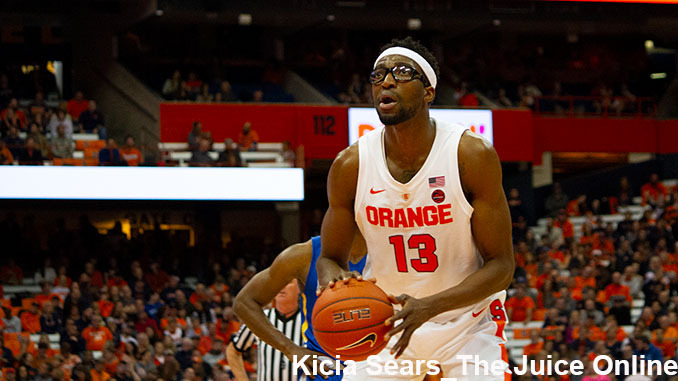 ANALYSIS: One game after Syracuse struggled against Cornell, the Orange played one of its better games from both ends of the floor. On offense, SU assisted on 20 of its 26 field goals after coming in having assisted on less than half of its field goals for the season. Syracuse also took care of the ball, turning it over just seven times. Still, the Orange shot 43.3 percent from the field and 9-13 from downtown, fairly pedestrian numbers. Defensively, Syracuse forced the Huskies into 34.0 shooting from the field and 6-28 from distance, stymieing Jordan Roland .The guard came in averaging 15.9 points per game, but finished with nine points on 3-13 shooting (2-11 from downtown). HERO: Brissett, after some early season struggles, has enjoyed three games of solid production. He led SU with 21 points and 14 rebounds, while Elijah Hughes chipped in 17 points. Buddy Boeheim, two games after being benched against Ohio State, finally got it going with his shooting range. He finished with 11 points and three 3-pointers. Robert Braswell got his first minutes of the season late in the second half, and immediately hit a corner 3-pointer. He also caught a transition pass from Frank Howard meant as an alley-oop, and was fouled going up, and ended up hitting both free throws for five points. ZERO: Tyus Battle struggled, shooting 1-7 from the field and missing all four of his 3s for two points. WHAT’S NEXT: Syracuse rekindles its Big East rivalry with Georgetown, hosting the Hoyas on Saturday at 3:30 p.m. TV: ESPN.